Spend this Valentine’s Day with the one who loves you the most, never cheats on you, often surprises you with lovely presents and always treats you well and with respect... With your beloved Eat-Sleep-Bet Casino! This year, to celebrate the wonderful relationship with our players (days with some, months with others, and years with many), you can claim on 14th February 2019 a 50% Valentine’s Bonus up to 100.00 EUR for your deposit of € 15+. Just tick the desired bonus while confirming your deposit in the cashier and start off your slot romance right away! That winning feeling is so sweet. Not only plays, movies and books, but now even a Pragmatic Play online casino slot tells the famous love story of two lovers Romeo and Juliet. The epic tale unfolds on 5 reels with 25 fixed paylines and a maximum bet of 125 euro. Don‘t expect any virtual reality sensation though. The casino game desgn is very classic, as is the story of Romeo and Juliet, with simple game symbols and straight forward special features. Romeo appears as Wild on the 1st reel and moves on the same row to the right with every spin, as he awards you with 5 free re-spins. Juliet does the same trick, but travels from the 5th reel to the left. And if they happen to meet on the same cell, unspeakable things happen in the romantic moonlight and 25 Free Spins are yours! Are you strong enough to resist the forbidden attraction of the online casino slot Romeo and Juliet? Hop on a gondola and cruise the picturesque channels of Venice, also known as Venetia in Latin, in so called online casino slot from GameArt. This 5 reel casino game with 20 fixed paylines takes you on the most romantic trip of your life, with its Venice themed game symbols such as golden winged lion, a masked female, a pair of doves, two snaps of the city and playing cards, from 10 to A. Get yourself a mask and join the famous Wild carnival madness. The silver mask substitutes for all symbols except for Scatter and also multiplies the formed wins by up to 5 times! But what is it all players at Eat-Sleep-Bet Casino come to Venetia for? The famous gondola ride, of course! Spot 2 or more gondola Scatters anywhere on the reels to get an instant coin win. Take a cruise in 3 or more of them to have fun with 15 Free Spins with 3x multiplier. Or find all 5 of them to win 20 000.00 euro Jackpot if playing with the maximum bet of 40 euro. And just when you thought you’ve seen it all what online casino slot Venetia has to offer, here comes a surprise… Scatter is not the only game symbol which has to appear just twice at the same time on the reels to pay you a coin win. There are more of them! 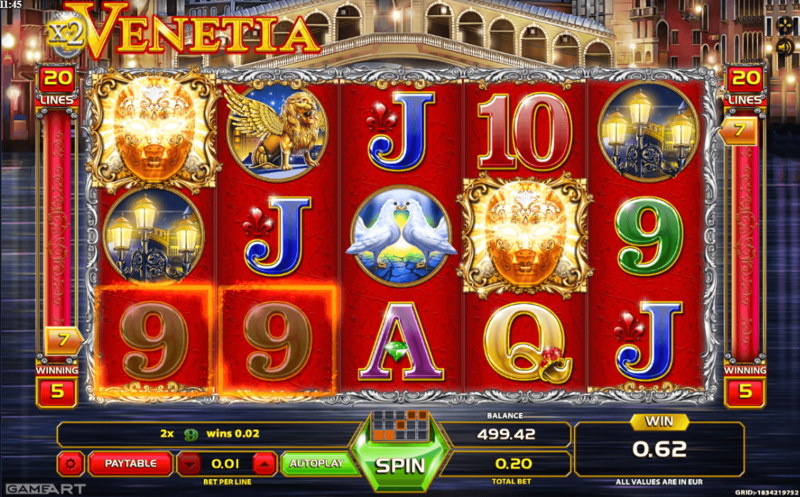 Lost yourself in the streets of magical Venice and experience all the adventures that online casino slot Ventia hides within. The next trip leaves from Eat-Sleep-Bet Casino right now! And for those who really want to get overdose with Valentine’s sweetness, there’s plenty more love themed online casino slots at Eat-Sleep-Bet Casino at your fingertips: Love Guru from iSoftBet, El Toreo from GameArt or Starlight Kiss, Immortal Romance, Burning Desire and Secret Admirer, all developed by Microgaming. And if that’s still not enough, have a look on our Valentine’s blog post from last year and spin it on Gypsy Rose from Betsoft or relive Microgaming’s Secret Romance. Love is in the air at Eat-Sleep-Bet Casino this February, hand in hand with impressive winnings!